In today’s video I’ve filmed a getting pinup ready video where I’m sharing vintage hair and makeup tips as well as chatting about what’s going on in my life at the moment. ✦ My favourite makeup products. ✦ The Vamp Stamp review. ✦ Pinup Eye Makeup tutorial. ✦ Classic Victory Roll Tutorial. ✦ Lola Von Rose lipstick, today’s colour Red Roses. I’ll have my next fabulous video out on Saturday! 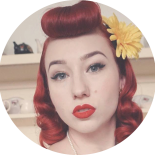 This entry was posted on September 20, 2018 by Miss Lady Lace in Videos, YouTube and tagged 1940's, 1950's, blogger, glamour, miss lady lace, miss lady laces pinup blog, perth, perth pinup, perth pinup blog, perth pinup community, pin up, pinup, pinup blog, pinup blogger, pinup fashion, pinup girl, pinup life, pinup lifestyle, pinup perth, red lips, retro blog, retro girl, retro glamour, the perth pinup community, victory rolls, vintage, vintage blog, vintage blogger, vintage fashion, vintage girl, vintage glamour, vintage perth, vintage pinup blog.